Have you ever wondered what makes music lessons a high-point during a student's week? I'll show you my students' 3 FAVORITE things that make their music education a creative exploration filled with laughter and learning. "Can we do an activity from the Pink Binder?" is a question I hear ALL the time. The Pink Binder is chock-full of all kinds of fun music activities that I have created for my students. The activities cover everything from interval identification to note reading, the circle of fifths, rhythm, and much more. I must say, there is nothing more exciting than having students ask to learn more! The Musicality Game is a new addition to my music studio. I created this game as a fun and exciting way for students to test their music comprehension. 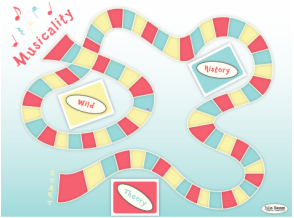 There are three different categories that are covered in the Musicality Game: theory, music history, and "wild." The Wild category covers a wide array of musical knowledge beyond the scope of theory and history. My students absolutely LOVE our kinesthetic learning activities! By using a wide range of modalities (visual, auditory, kinesthetic/tactile), we are able to engage different areas of the brain to increase learning and retention. These activities also provide a meaningful way for students to get rid of their wiggles while having a fun musical learning experience. Some of the kinesthetic activities that we use include our Music Note Bean Bag Toss, Rhythm Parade, Note ID Relay, and more. Not only are these activities beneficial for student learning, but they are also a ton of fun!